With a solid winter and early spring of training behind you, the first bike race of 2016 is quickly approaching. Be it your first race ever or the first race of the year for you, there is likely some anxiety to overcome. I have been racing for 30 years and I still get extra nervous for the first race of the new season. Channeling your race day nerves could actually improve your performance. One way to help prevent undue stress on race day is to not leave the logistics to the last minute. Having your bike ready, your gear ready, and knowing what to do when you get there will allow you to focus on what you have been training for rather than unexpected events. Make sure your bike is ready. This may sound obvious, but a frequent common mistake is showing up on race day with tires in poor condition or shifting issues. Spend time and effort beforehand to ensure your machine is good to go. It is that simple. My race bag list is something I have been trying to perfect for some time. While it is well-stocked on race day, I am always making changes to it. Pack it the night before you leave. Unless you live in Southern California, you need to prepare for conditions to change at the drop of a hat. Check the weather forecast the day before as this will at least give you an idea of what to bring. Also, the time of day that you race can be a factor. The temperature may be a high of 80 degrees, but if you race early in the day, it may only be 65 degrees when you go off. In this case, having warmer gear like arm and leg warmers, a jacket, and cap is critical. It is always good to be a little over-prepared. Pack some rain gear like a rain coat, shoe covers, a cap to go under your helmet, and long fingered gloves just in case. Again, arm warmers, leg warmers and a jacket are always good to have for early season races. Better to have it and not need it rather than need it and not have it! Other items on the list include hydration and nutritional needs. Bring a sufficient supply of water. You never know how accessible water will be once at the course. You should have enough for pre-race, racing, and post-race recovery. Prepare your race bottles, recovery bottles, and your food the night before. After a race, it is important to work on your recovery as quickly as possible and no assumptions should be made about the availability of food or water. I like to have a full post-race recovery plan in place; both recovery drinks and a meal. Having everything ready saves the extra hassle of searching out, waiting in line, etc. Get to the race two hours before your start time. Being early allows time for getting lost and finding parking without cutting into your warm-up. Once there, immediately locate the registration area. Get signed in and pick up your number before previewing the course. 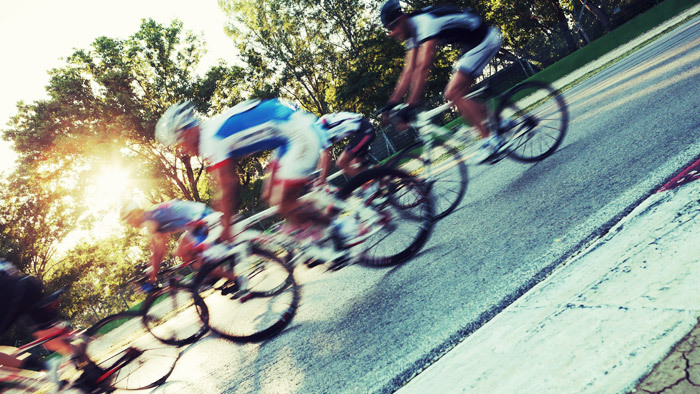 If the race is a criterium, you could walk or even ride the course between races. For road races, some racers like to drive the course. In either case, make sure it is okay to be on the active road beforehand. Pay special attention to the location of the finish line. Memorize land markers, etc. so you know when to sprint or when to be at the front of the race. Two hours may seem like a lot of time to be standing around. The key is not to stand around but be active and get in the zone. Be dressed with your number pinned on and ready to climb on your bike for your warm-up one hour before the start. If using a special race mix in your bottles, warm-up with separate bottles so you don’t inadvertently use your race drink. If you have a set of race wheels, do your warm-up on your spare set. It is horrible to flat your good wheels before the event even starts. Arriving early also allows you to get a solid warm-up in without being rushed. A criterium will always start fast, so your warm-up is critical. Some race locations might not be conducive for warming up on the road. Research the venue ahead of time, you might have to do your pre-race warm-up on a trainer. Whichever the case, have something planned ahead of time so you avoid just “riding around”. This is not a sufficient warm-up. A 30 to 40 minute structured warm-up is generally adequate to prepare the body. Okay. You are finally ready to race. If the race is expected to start fast, like a criterium, try your best to get a front row start. The tricky part is to get the timing right between the end of your warm-up and getting to the start line for a prime spot. Ideally, a 10-minute gap is about the maximum amount of time to leave between warm-up and start. When lining up for a criterium, try to line up on the opposite side of the first turn. Generally, everyone bunches up there and you can now sweep around the outside and improve your positioning for the race. If the race is expected to roll out casually without going full-bore from the gun, for example a long road race, starting position is not as critical. Personally, I like to always start as close to the front as possible. You have finally gotten yourself to the start of your first race. The final element is to let your training rule. Go out and race hard because you have done everything else you can. Beginning racers and experienced racers alike continue to learn and perfect the race-day preparation. You will make mistakes. Learn from them. Then don’t make the mistake again. Be as prepared as you can be ahead of time! You have spent a lot of time, money and effort preparing for this day. Why have it ruined by poor planning?